In the winter, when the Sierras are covered in snow, rock climbers head for the desert. 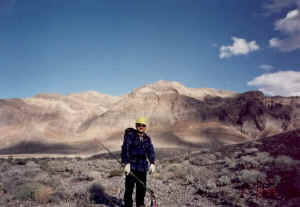 Three miles south of Death Valley Junction is Eagle Mt. 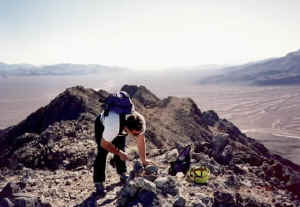 About 20 miles to the west is Telescope Peak 11,049' in Death Valley. About 20 miles to the east is Mt. Charleston, 11,918' in Nevada. Eagle Mt. is composed of a black, abrasive volcanic rock. A pair of leather gloves comes in real handy here, especially on the descent. The first picture is of the west face of Eagle Mt., taken during the half hour approach hike. 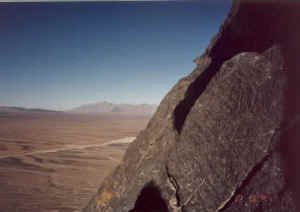 The second picture is looking NW during the climb. At the top is a summit registrar to sign. The walk off route is excruciating in climbing shoes. Use hybrid shoes for the entire climb or bring a separate pair for the walk off. 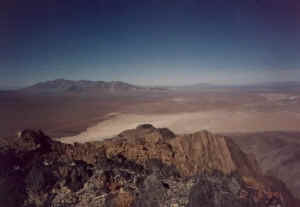 The last picture looks north from the summit, toward Death Valley Junction. North from the summit toward Death Valley junction.